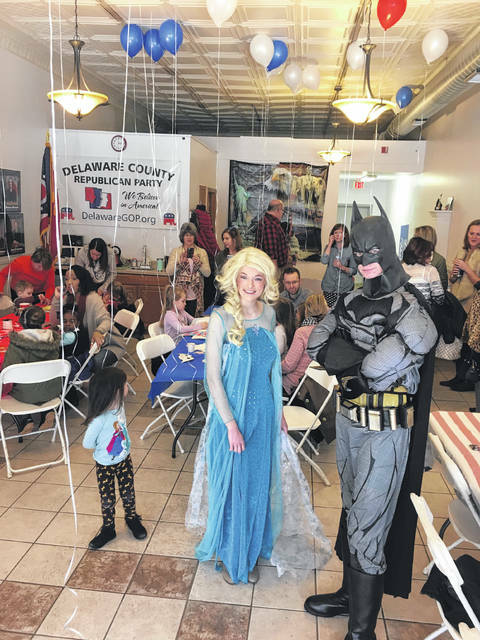 During the GOPMoms kickoff event held Jan. 21 at the Delaware County Republican Headquarters in downtown Delaware, area kids were treated to a surprise visit from Elsa and Batman. More than 1,100 diapers were collected by GOPMoms during a collection drive held at the Delaware County Republican Headquarters in downtown Delaware on Jan. 21. The diapers are being donated to People in Need and the Common Ground Free Store. GOPMoms, a group of likeminded women, was the idea of Delaware County resident Melissa Schiffel. The mission of GOPMoms is to further conservative values and collaborate for a common cause. The diaper drive was the group’s first mission and was part of the Jan. 21 kickoff event, which featured a suprise visit from Elsa and Batman, who spent time with the kids in attendance. The event also included crafts, hot chocolate and cookies. Ohio Supreme Court Justice Judith French made a guest appearance at the kickoff event as well as local county elected officials Judge Randall Fuller and Municipal Clerk Cindy Dinovo.